Being harvest time, the produce at the markets is incredible. That includes a bag full of brilliant green brussel sprouts. I’m in love with my stove and thankfully the weather has been miserable enough that I don’t want to use the BBQ, being cool enough to boot up the oven. This was a request from the Hubby – to have baked brussel sprouts with parmesan cheese. I didn’t have any parmesan, but the asiago I had on hand was more than acceptable. Baking brussel sprouts let them get those crispy leaves, making the insides tender. I keep them fairly simple and you could jazz them up as much as you want. Add some chili flakes or spicy seasoning if you’d like! Hubby gave the thumbs up, which is always a plus when trying to come up with vegetable dishes we both like. Trim the brussel sprouts and place in a large ziploc bag. Drizzle with olive oil and add desired seasonings to the bag. Toss so all the sprouts are coated. Parchment line a cookie sheet and pour the brussel spouts on the sheet in an even layer. Bake at 400F for 30 minutes, or until the sprouts have crisped up. 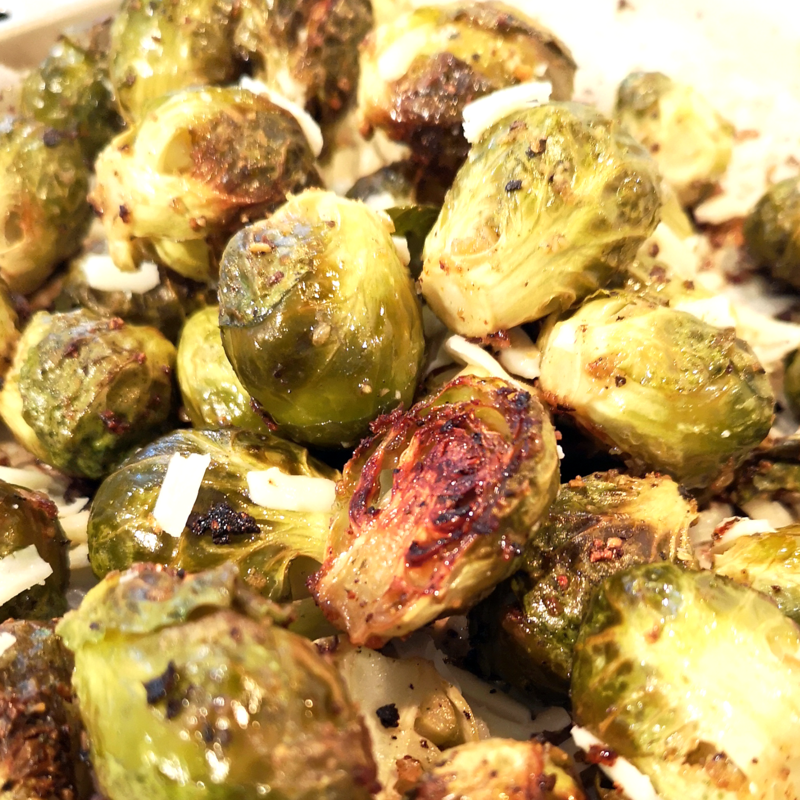 Toss or shake the brussels spouts when 15 minutes to evenly cook. Remove from the oven and grate the cheese over the brussel sprouts.